Vapor Trails imbued with sunlight fill a blue sky on some December days. 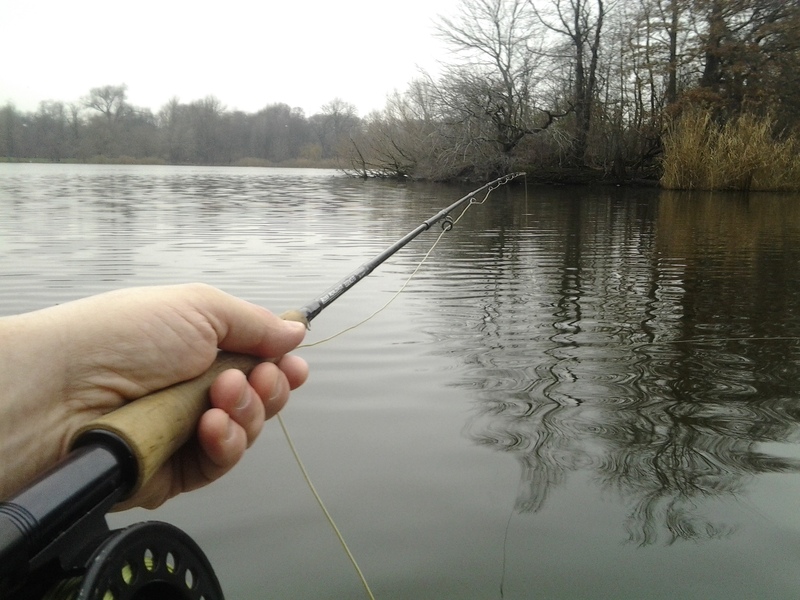 One last one above the temperature of 40 degrees Fahrenheit beckoned me to follow through on one final item of outstanding tenkara fishing business: Taking my Tenkara USA Yamame rod for a test around Prospect Park Lake in Brooklyn. Brooklyn . . . Of course. I had to go there at least once in 2014. Completion of mission vital to my own authority added a pinch of incentive as well. Prospect Park had not seen my traditional tapered line all season. The Bronx, Manhattan, as well as Queens have all been noted as has fishing the Hudson’s New York Bight’s salt adjacent to Staten Island. 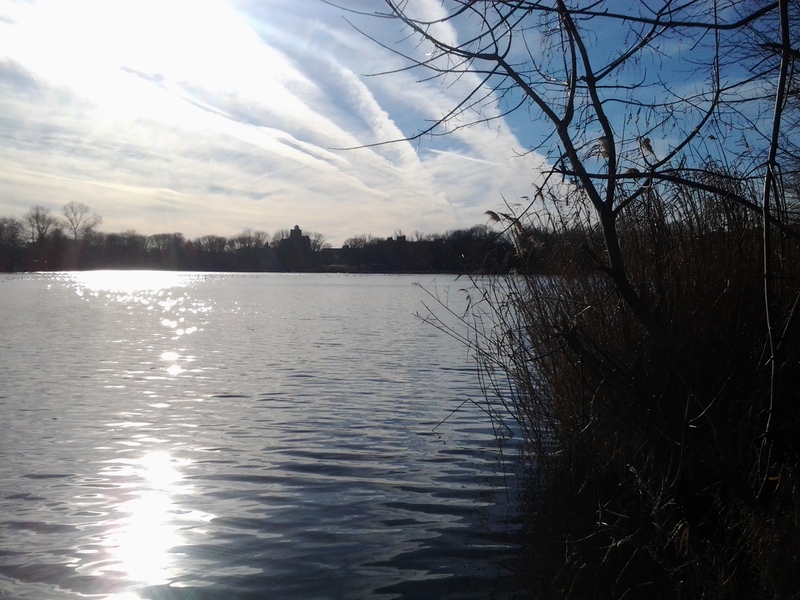 Four, not all five, boroughs in total, the count found wanting a major one of New York City’s destinations: Prospect Park Lake. The omission appears even odder considering Brooklyn’s coolwater lake has the highest notoriety for catch and release bass fishing. For nine months of 2014, I have fished hard, in and around town in between serving as a guide to new gear at an urban fly shop. 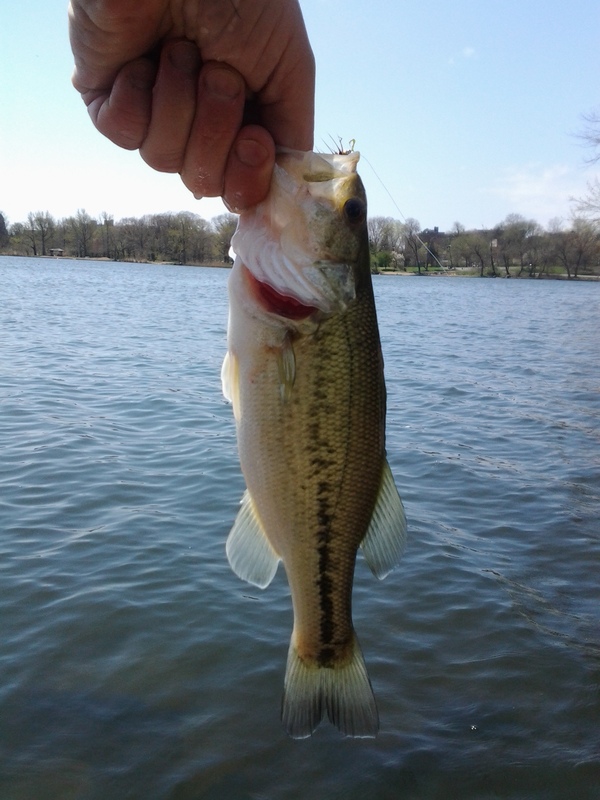 My first catch of a bass happened as early as the final week of winter in March. Trips in between then and now included meeting the saltwater papio of O’ahu, Hawaii. I had been to Brooklyn a bunch of times for friends and culture. Time then to go fishing there as well at the eleventh-and-a-half hour of the year. One of my own pioneering tenkara trips took place along a portion of Prospect Park Lake’s asymmetric circumference. The lake has over a span of years drawn me and several of my companions together in search of fish on the fly. Earliest spring and fullest summer have been experienced, never winter. The cold day squeezed between Christmas and the New Year began bright and breezy, qualities that made the prospects look challenging in all ways but my own confidence. I knew, just knew, some kind of fishing would present itself if I maintained the kind of endurance and mental focus I must exhibit to complete a cross country run along a bright and breezy Hudson River waterfront. Conditions lakeside enforced an immediate variation on my use of line. My traditional tapered lines were set aside in deference to Level Line attached to a much longer tippet of finer 6X. Unfocused invisibility can be seen as obvious given cold lake water’s clear visibility. Water temps in the high thirties Fahrenheit discourage green plant life, and the recent season’s remains now rest brown and settled. Prospect Park’s water and its column become a more translucent body skirted by shores of cattails, trees limbs, and stone and mortar wall. Large nymphs work to lure fish during the cold season. Leaf litter offers ample residences for the dobsonfly among others. Whether it be a Kebari americana like The Prince, Zug Bug, your own variation on the theme, or the all-inclusive Woolly Bugger, unweighted or beaded patterns are effective. More important may be presentation. Some strip in a nymph when stillwater fly fishing. Fair the approach may be, as well as a Leisenring Lift customized to your speed theory, or a sustained swimming action that takes advantage of an unweighted fly pattern’s buoyancy . . . I grinned when the technique met a take. Connection to a fish had first to endure several persistent hours of casting in and around some brisk breaths of air off the water. 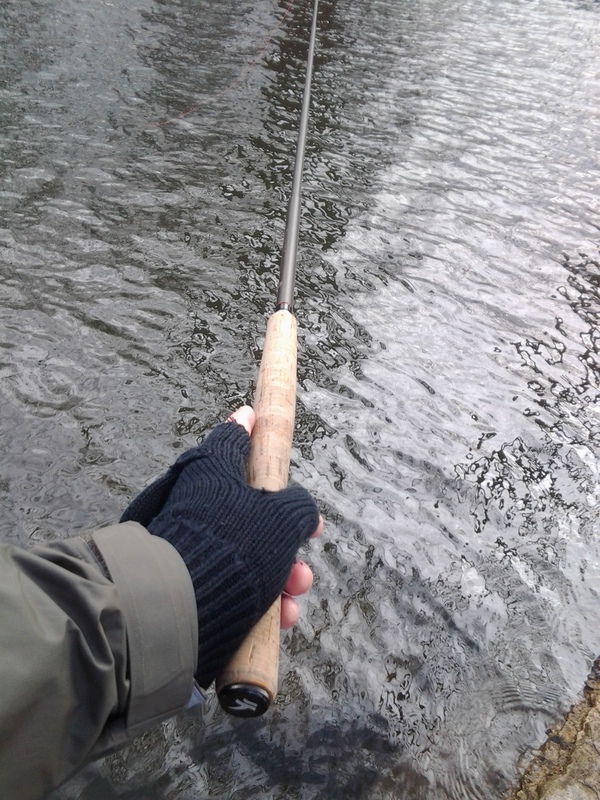 Coldweather tenkara this was. No topwater action was on deck. The kebari patterns were a dice roll that occupied my mind: Olive Dobsonfly, The Prince, Zug Bug, and my own Grey Wet Wool Nymph described in my second book, Small Fry: The Lure of the Little. Sizes ranged between 6 and 10. What changed during the day was the wind. Air and lake calmed during the last hour of daylight. I finished with an Olive Woolly Bugger tied by steelheader Stephen Kasperovich of Sewickley, Pennsylvania. He is adept also when angling for yellow perch, the fish that turned my fading prospects at Prospect into a grand form of fishing finale. His pattern uses a very soft chenille body matched with an undulating saddle hackle. Several seconds after I began to swim the Olive Woolly Bugger, a fish met the fly and connected. Several runs of ten feet and head shakes bent the Yamame and played me before I lifted a perch in net from the water. 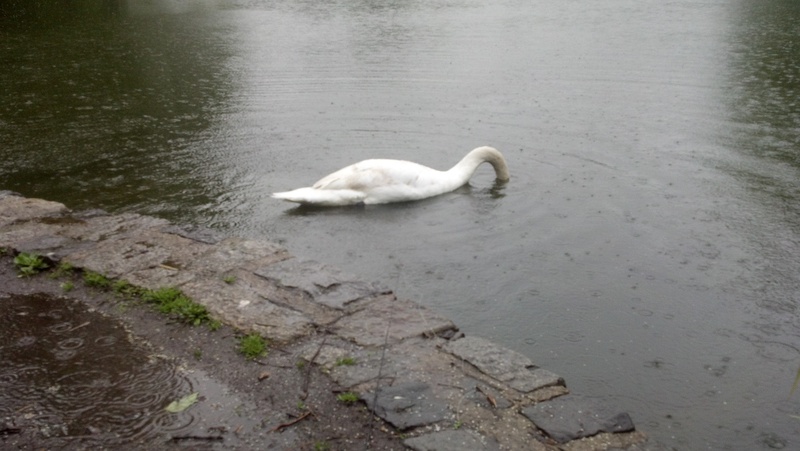 Perca flavescens has been encountered before both at Harlem Meer and Van Cortlandt Park Lake during late August and September. The species is a popular quarry for ice fishers, making its presence and activity understandable on the calm end of this cold day. 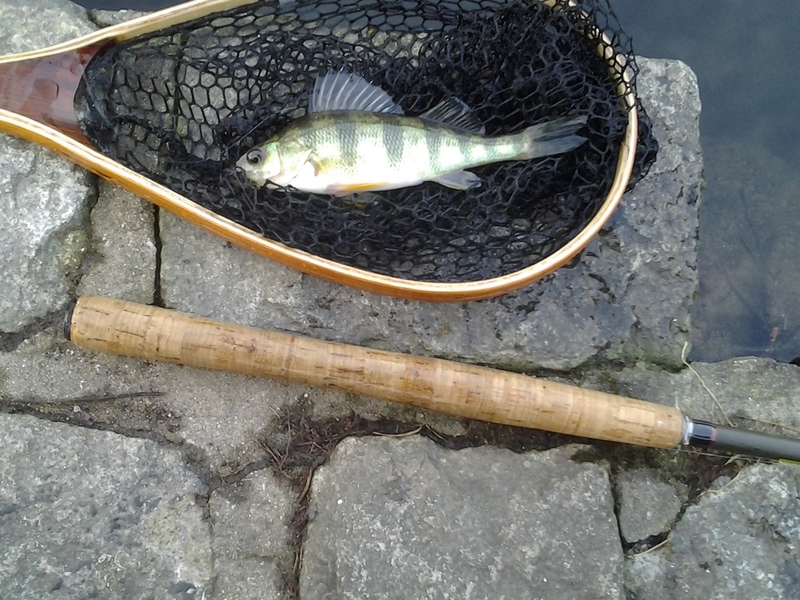 Several more perch followed, although not in a metronomic fashion one might associate with a large school. Each fish had to be worked, had to be coaxed, into striking. 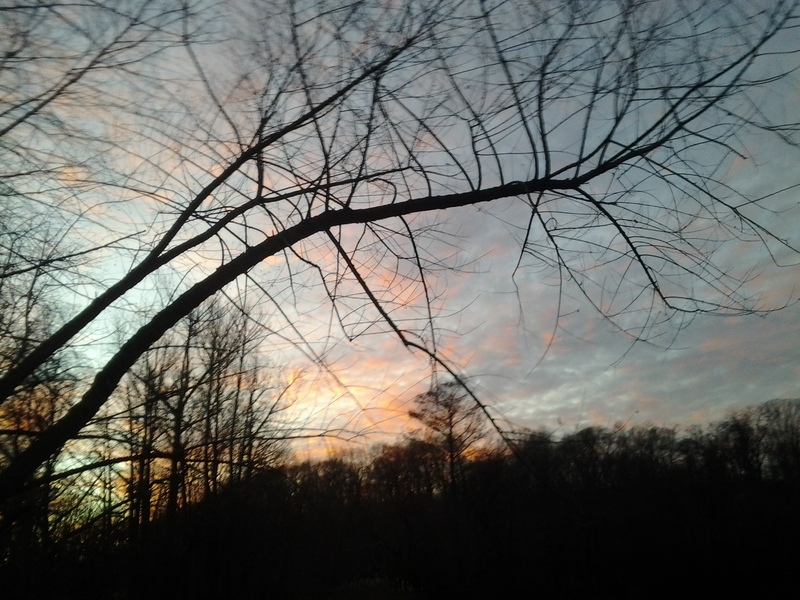 The hinge of the entire experience was again a willingness to put full thought into full motion forward. 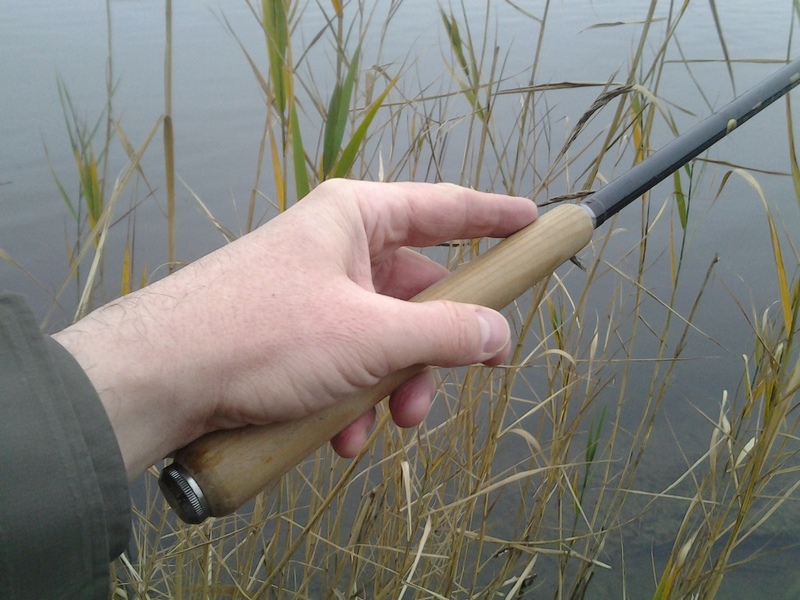 Full cast and retrieve with a focus on the fly at the end of the Level Line. 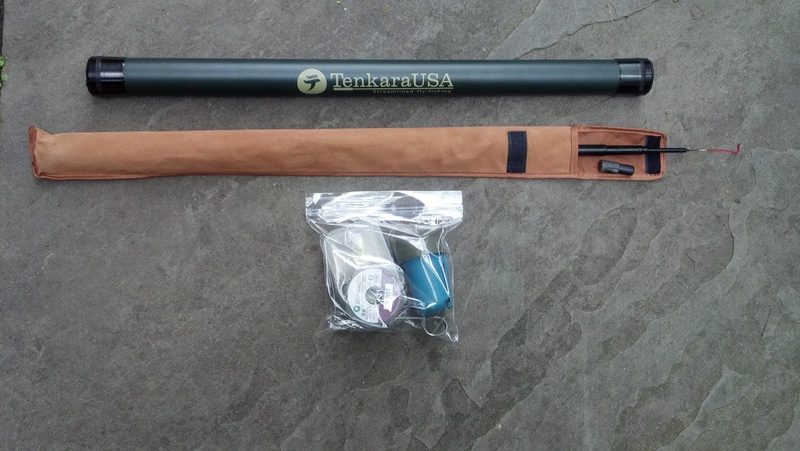 Any slow swimming retrieve using wrist action combined with a lift can take tenkara fishing into catching. The other factor may well be that I found a spot holding some fish at prime time: the short span of minutes that can make up a wintertime bite. Bird life communed on and around the lake. 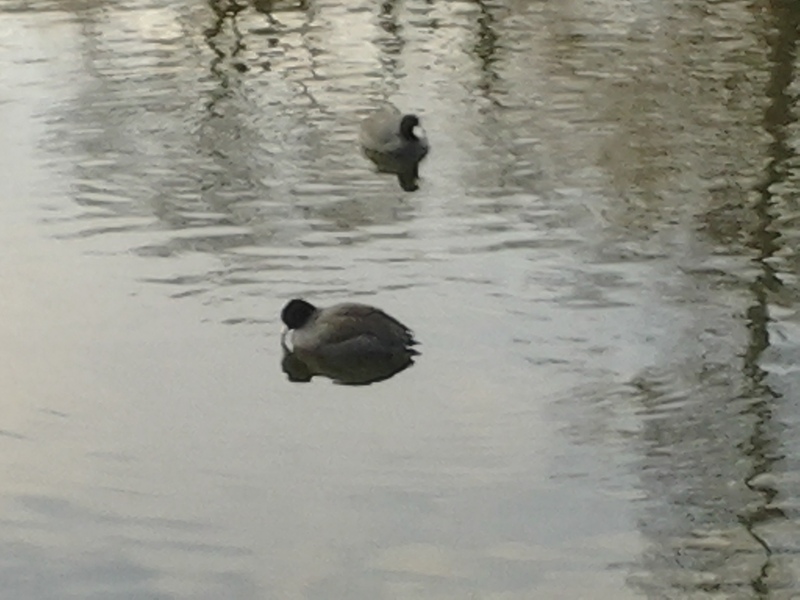 American coot, Fulica americana, plied the calm water and called at dusk in the manner of gas passing out of either end. Strange, mildly humorous, a sound like belching farts almost quite nearly contradicts the bird’s conservative plumage, which may bring to mind a solemn clergy’s robes. The day’s final sunlit moments brought a final yank transmitted down to the grip of my Yamame. The strategy of the competitor changed. 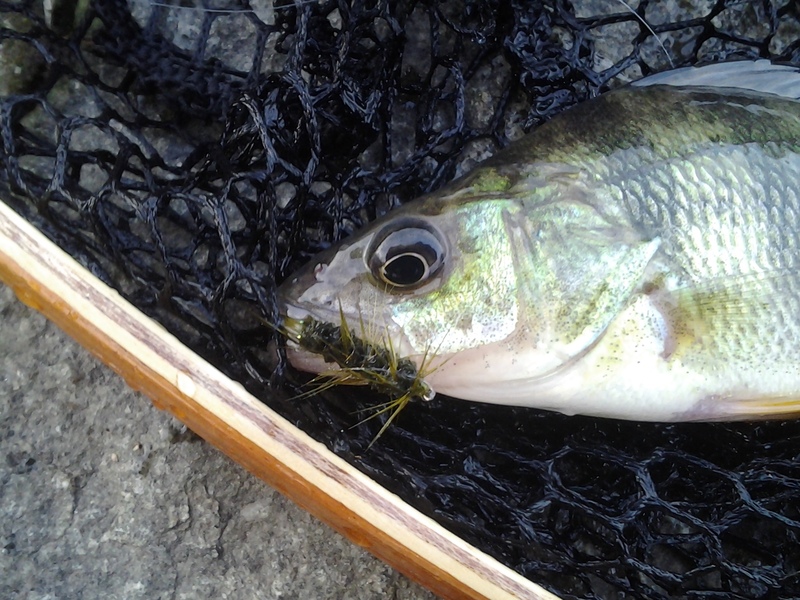 Now a tight, circular fight, at net’s end my heavier opponent turned out to be a very round bluegill dressed in a pale purple sheen with olive details and black chain link bars twisted and reminiscent of the double helix. 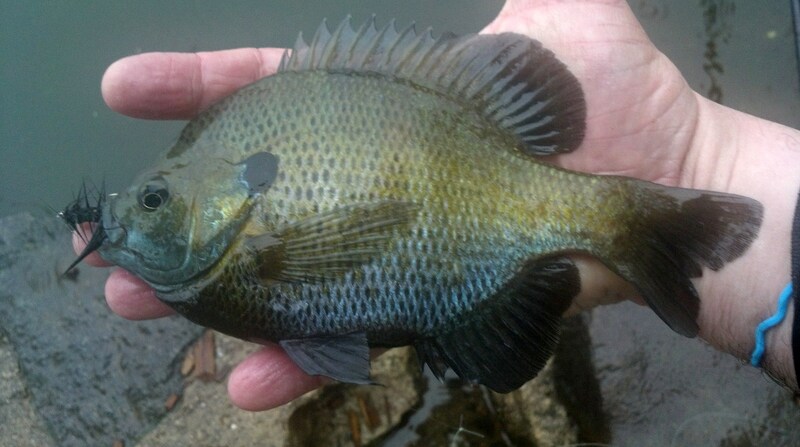 Bluegills can be a rare encounter after the spawning bed period. Even small waters may find a bluegill population strangely reticent despite a circumscribed space. 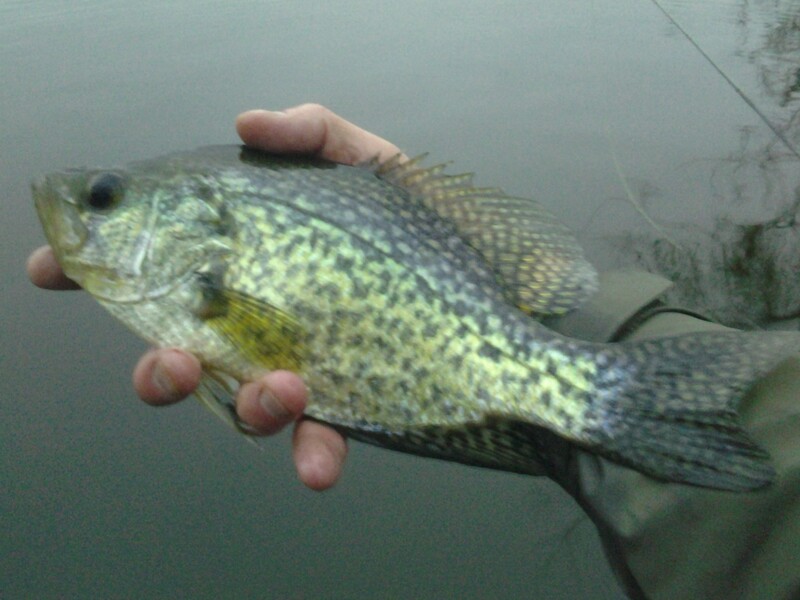 I felt more than pleased to call this fish my final catch and release of the year. Lay the city bathed in sunset. At the end of this “last day of December” the trees rather that the tower blocks were tinted. Earth Day 2013 . . .
Today I took the Q train to Prospect Park in Brooklyn where I spent Earth Day fly fishing, bird watching, photographing wildflowers, and . . bagging and disposing of litter. The phrase “use the resource” seems selfish when applied to parks and other outdoor spaces. I do not consume the outdoors, I interact with and help out when I can; today by bagging the loose plastic trash that has spread like a virus over the land during the last three decades. The day encompassed an entire story I wish to take more time to detail later in the week. Let me just state here the bass fishing was excellent using variations on the Wooly Kebari fly pattern! Happy Earth Day . . . The exploration of a pond can be a lot of fun when the body of water has a shoreline full of narrows and declivities where fish can cruise, hide, and challenge one’s casting. I like to approach this kind of deconstructed angling with a variation of prospecting as described by its most eloquent contemporary proponent, John Gierach. He devotes an entire chapter to “Prospecting” in his first published angling book, Fly Fishing the High Country; a minor classic that I seem to read at least once a year. While Gierach refers more broadly to the search for and exploration of new wilderness waters, his process can be applied, using maps and the soles of one’s shoes, to the microcosm of a single pond’s perimeter. One of the best, perhaps the best, of New York City’s warm water destinations is the lake situated near the southern end of Prospect Park. 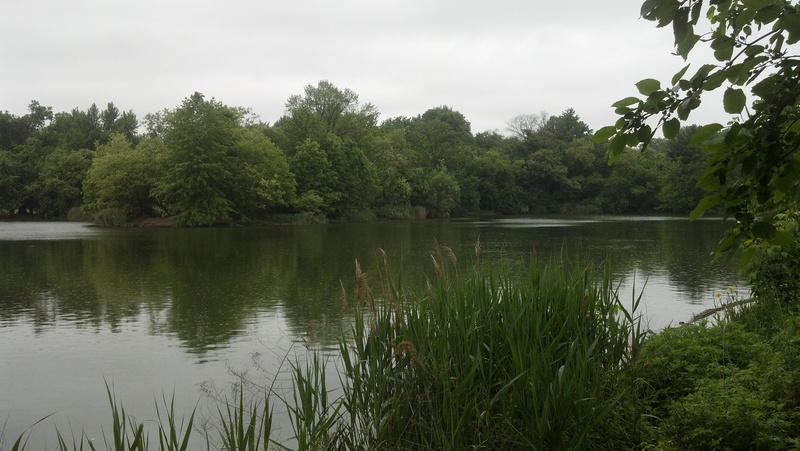 Designed by Olmsted and Vaux, the same team who created Central Park, Prospect’s lake appears rougher around the edges, shaded by mature trees, with ample waterfowl and fishing opportunities for those willing to drag their gear onto the subway. One of the potential drawbacks of urban angling is the logistics of carrying fishing equipment to and from the water. Tenkara has, for me, eliminated this concern. Before I left my West Village home to catch the Q train to Brooklyn, I first grabbed a reclosable sandwich bag and filled it with my assembled gear: fly box, spool of level line and tippet, and my two personal extra essentials, forceps for more humane hook release and a microtrash container. 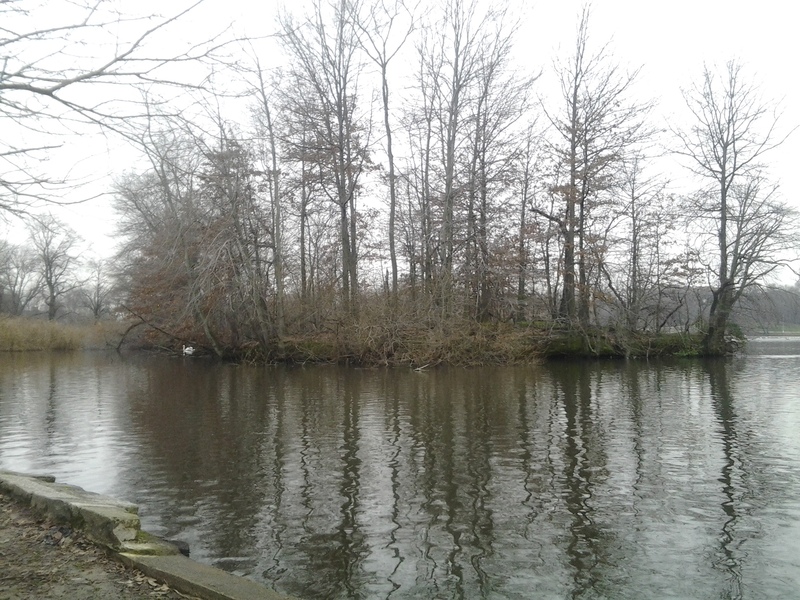 Weighed down with almost a half pound of fishing gear, I ventured out into a gray morning. The rush hour commute was made easy and even more importantly, unobtrusive, by the single little bag of gear nestled in the right front pocket of my cargo shorts. No stares or questions from the other commuters. I was just another man on the train. Dressed down, yes, but just a man. And I even had a free hand to hold a to-go cup of coffee. The morning mist had turned heavier and steadier in the outer borough. The scene inside the park, still in view of Parkside and Ocean Avenues, consisted of a giant rinsed salad. There was a steady breeze to give it all rustle and the jade surface of the lake a little ripple. Best of all for me, given my purpose, was no one else in sight. 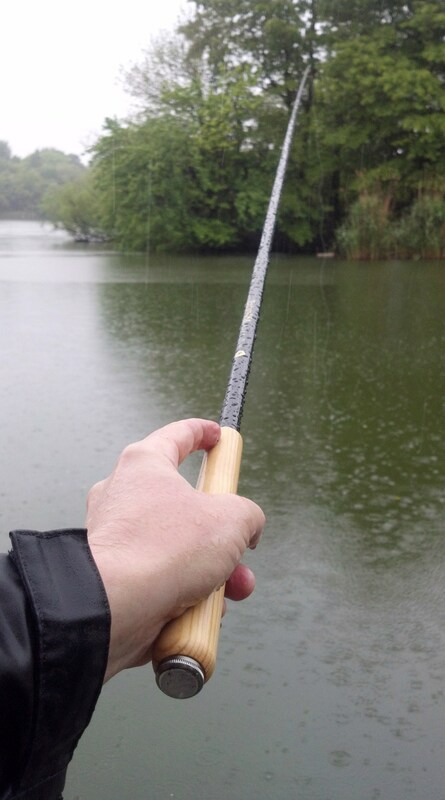 The real advantage of city fishing during inclement weather is the removal of the unwanted wildcard: individuals and crowds who use the park for purposes other than angling. When the lakeside is devoid of children playing, mothers calling, and old duffers drinking, the fish are much less spooked and casting is far less stressful. I don’t have to watch my back for “stick ’em up!” or potentially litigious passersby who could get hooked by a backcast. I kneeled on a lush hummock, knotted on a size 10 Black Woolly Bugger, which was to be my one and only tenkara code streamer for the day. The pattern’s size and silhouette fit my estimation of what would look best from a fish’s point of view, considering the overcast white sky. A largemouth bass concurred after a few casts. 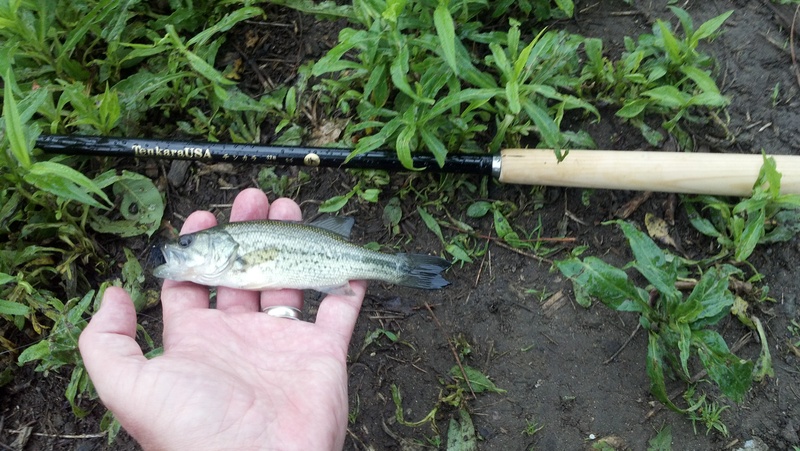 Tiny, yet feisty, my first Brooklyn fish caught on tenkara took its cue from my most recent book; it was a small fry. The fishing, and catching, continued from that encounter. The prospecting approach had me probing little coves, casting along the edges of cattails, and bending below overhanging branches. Tenkara, specifically the level line, allowed me to achieve these feats of fishing with much more accuracy and gentility than a 5-weight matched with floating fly line could. There was also much to hear and see on the sidelines. Red-winged blackbirds sounded their rusty gate calls. Mallard ducks mumbled around me. One large swan visited when I paused to tie on a fresh tippet. The bird dipped its head below the waterline as it foraged, and then flashed me a look after it had finished; a look as if to say: “There are some fish down there.” I targeted the edge of some nearby abandoned bluegill beds and was in fact rewarded with a largemouth bass that made an athletic corkscrew leap above the lake. 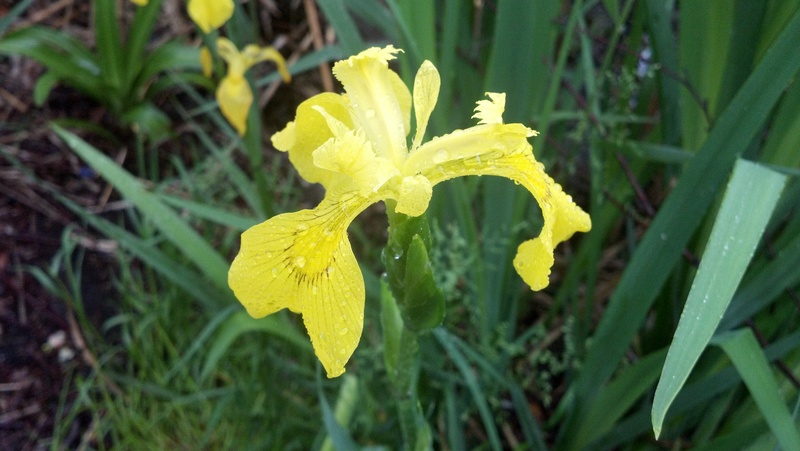 Another highlight I found along the bank was clusters of yellow flag, Iris pseudacorus: the wild iris that Henry David Thoreau admired so well in Walden. The middle of May marks the peak blooming period of this flower in the New York region and, on a day as overcast as this one was, the brilliant petals glowed, containing, it seemed, all of the bright light energy of the sun. 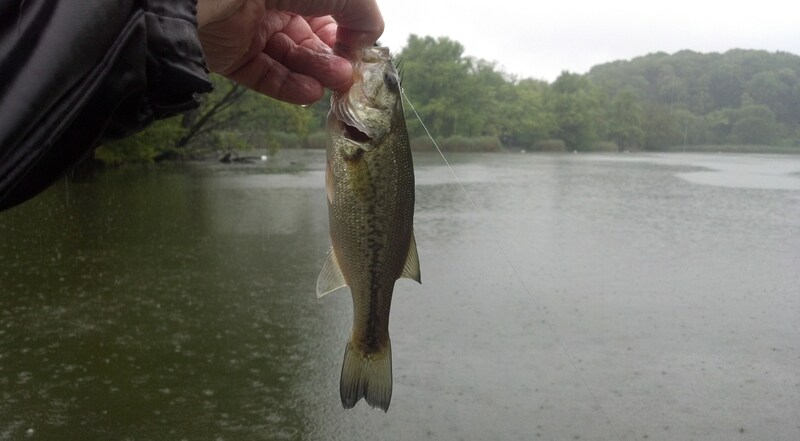 Once the rain turned up a notch after the noon hour, the bite declined, eventually ending. Sustained shivers started to shimmy up and down my back. Even the birds silenced. The only sound was the sizzle of the rain impacting on the lake and my mind’s voice encouraging departure. 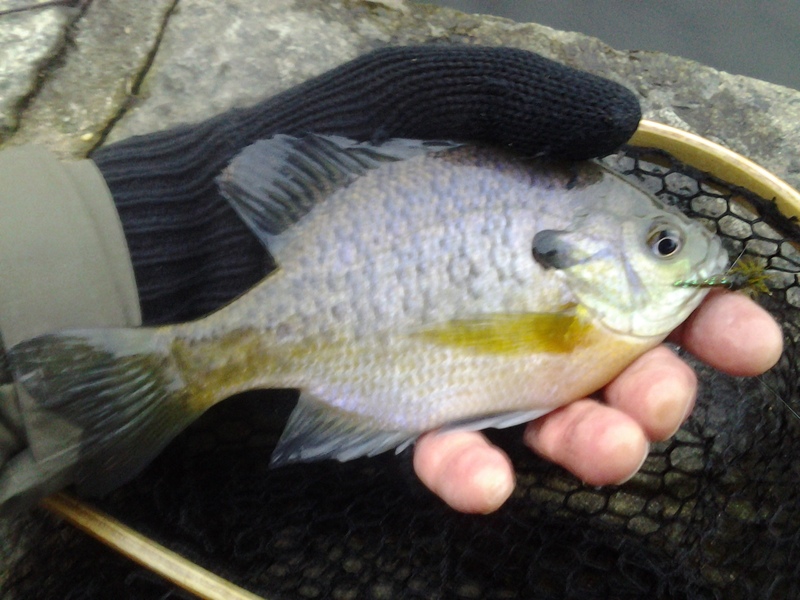 The afternoon was young, but seven fish caught and numerous near misses had given my first tenkara adventure in Brooklyn a solid B . . .
. . . for Bluegill.